PARIS (AFP) – US astronomers said they had pinpointed the moment and location when one of the most famous landscape pictures in photographic history was taken. “Autumn Moon, the High Sierra from Glacier Point,” taken by Ansel Adams in Yosemite National Park, is a thrilling view of the American West, featuring a waxing Moon rising over dark, ice-tinged peaks. But precisely when Adams took the iconic black-and-white picture has never been clear, and dates for it range from the mid to the late 1940s. A team led by Donald Olson, a professor of physics and astronomy at Southwest Texas State University, claim that the mystery can be resolved. Using lunar tables, topographic maps, weather records and astronomical software, backed by a scouting trip to Glacier Point itself, the researchers believe that Adams pressed the shutter on September 15, 1948 at 7:03 p.m. Pacific Daylight Time. Their discovery is reported on the website of the US astronomical magazine Sky et Telescope (skyandtelescope.com), which publishes the paper in full in its October issue. The breakthrough came when Olson stumbled across a colour version of “Autumn Moon” that was published in the July 1954 issue of Fortune magazine but had escaped the attentions of Ansel Adams experts. By comparing the colour version with the black-and-white one, Olson was able to determine that Adams set up his tripod just off the Yosemite Park trail, below a geology hut. They believe their calculations are accurate to within 10 feet (three metres). Adams took the colour picture — part of a batch commissioned by Eastman Kodak to test new colour sheet film — at 7:01 p.m., according to their calculations. That gave him about two and a half minutes to change the film holder and adjust the settings on his camera and take the black-and-white photo. Olson has previously determined when Van Gogh painted “Evening Landscape with Rising Moon” in Provence and “The White House at Night,” painted at Auvers-sur-Oise, northwest of Paris. Those who wish to get a real-life glimpse of “Autumn Moon” are in luck this year. On September 15, the Moon will be in almost exactly the same position as when it was seen by Adams. 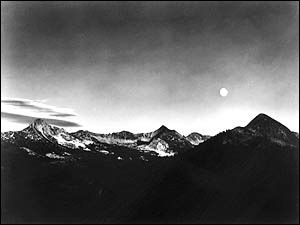 PHOTO CREDIT: AFP/OFF Photo – ‘Autumn Moon, the High Sierra from Glacier Point,’ photograph taken by Ansel Adams.